Click here to visit our main page on attenuators. Click here to go to our page on parabolic equalizers. Click here to find gain equalizers on everything RF. What's a gain equalizer (or "equalizer" for short)? It's a special attenuator that has a frequency response that is intentionally not flat. There are many reasons you might want to use an equalizer. Perhaps the most common is to fix the problem of wide-band microwave systems. Most stuff has a negative gain slope (it has less gain, or more loss, the higher in frequency you go) This includes not only amplifiers, but passive stuff like coax cables and microstrip transmission lines as well. The antidote to negative gain slope is adding a linear gain equalizer that has a positive gain slope to your lineup. A second type of gain equalizer provides a "parabolic" response, which is used to counteract the gain of wideband traveling wave tubes. We have a separate page on parabolic equalizers. There are not many microwave vendors that advertise equalizers as part of their wares, many of the techniques for this remain trade secrets of companies doing wideband work. Sorry, we're not gonna provide any links to equalizer vendors here, unless they show us the money! Here, you want to straighten out the gain of M/A-COM's MAAM37000-A1G surface mount LNA. 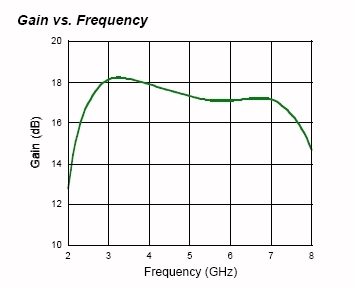 The gain plot below shows that it tilts about one dB from 3 to 7 GHz. Fixing this is an easy assignment, we're going to show you how to do it with a conventional surface-mount attenuator chip. All you've got to do is mount a 3 dB chip attenuator, with some added inductance to ground. Just move the ground via a few hundred mils from the chip with some transmission line, and you're styling. This is certainly the poor-man's equalizer! We need to take a photo of the configuration, and generate some plots, check back later for more details. Here's your next assignment. You have to build a wideband module, 1 to 40 GHz, with 20 dB of flat gain. Don't ask why, just do it! You decide to use a TriQuint MMIC, because you feel sorry for everyone that has stock options in TQNT, and you are hoping that by purchasing a few hundred amplifiers, you will put them one more wafer away from bankruptcy. 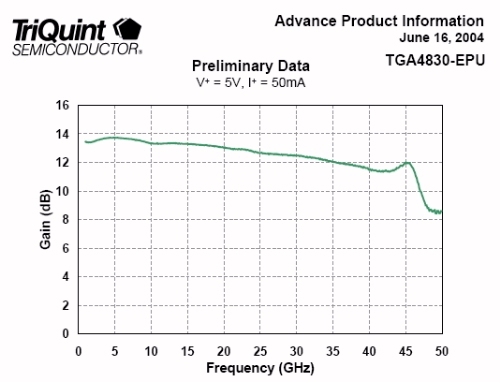 A good choice is the TGA4830, below we have pilfered its gain response from TriQuint's on-line data sheet. You can cascade two of these puppies and get more than 20 dB gain at 40 GHz, but you will have four dB of gain tilt, which won't go away using a conventional attenuator. Now what? 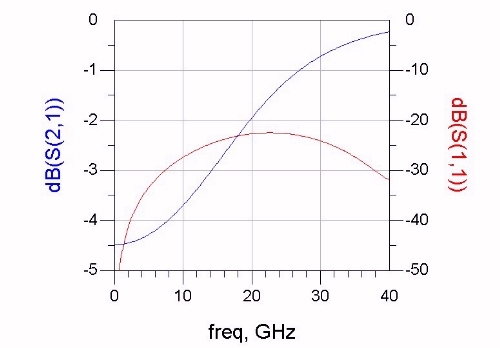 Let's design an ideal equalizer that provides four dB positive slope over the same frequency band, using ADS. One way to create an equalizer is to start with an ideal attenuator network such as a tee, and add capacitors to "short out" the series resistive elements with frequency, and inductors to "open" the shunt resistive elements with frequency. Like in the ADS diagram below. 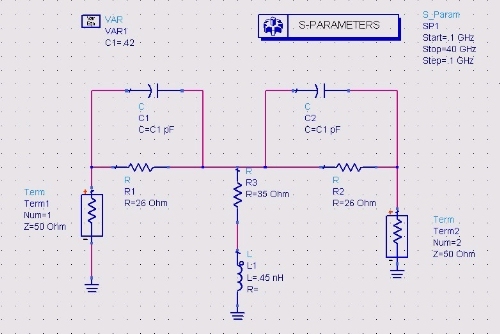 This is very much an ideal equalizer, we have left out all parasitics that would be present in a physical model. Note that the loss response is not perfectly linear with frequency, but it's close enough for government work. When add this puppy between the two TGA4830's, you will get a nice flat response. We'd show you the prediction, but TriQuint hasn't posted an S-parameter file on this amplifier yet. Don't get too excited at the success of this little project yet. You might not be able to build this equalizer without all the parasitic elements messing it up!